This beginner tutorial will lead you through the process of installing the WPCasa Madrid theme. What we need in order to start with the installation of the theme is a running self-hosted WordPress installation. After your purchase of WPCasa Madrid you will receive a download link in the purchase confirmation email or you can go to your account on our website to download the theme package wpcasa-madrid.zip to your local computer. 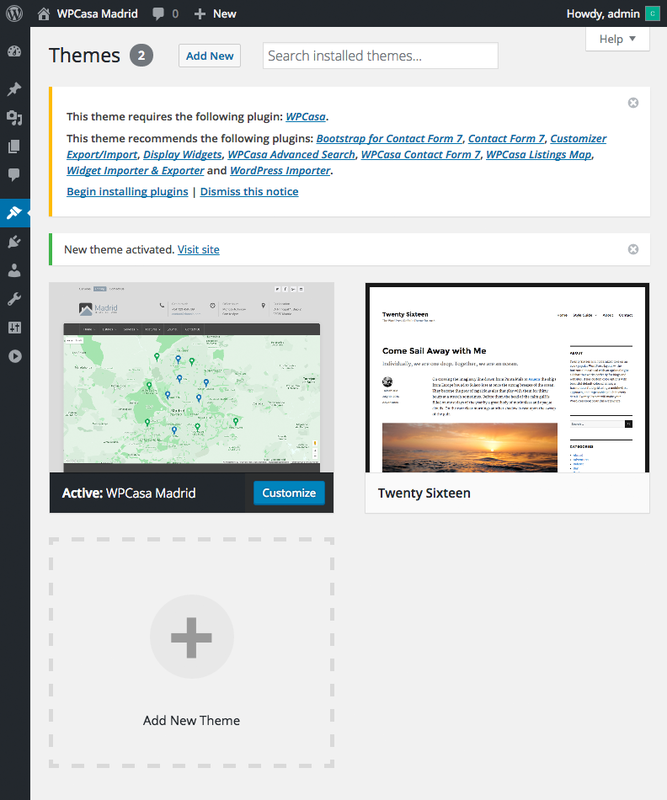 Now you need to enter the admin of your WordPress installation and go to WP-Admin > Appearance > Themes > Add New > Upload Theme and browse to the theme package on your local computer and click on Install Now. Once the upload finished activate the theme. The next important step is installing required plugins to make sure everything works. Therefore please go to WP-Admin > Appearance > Install Plugins and make sure that at least the required plugins (currently only WPCasa core) are installed and activated on your site. As the name states we also recommend to install the recommended plugins to implement all the features the theme demo has and to make sure the one-click importer works. You can deactivate them later if you don’t need them. The recommended plugins will not activate automatically like the required ones. That means that you need to activate them yourself. Just click on the link Return to Required Plugins Installer and mark all recommended plugin to bulk activate them. On WP-Admin > Plugins you can now see a list of plugins that we’ve just installed and activated. After installing the required and optionally the recommended plugins WPCasa has been set up and you can start adding your content. If you would like to start with some demo content, please read the tutorial about our new one-click demo importer.